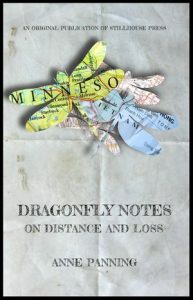 Essayist and fiction writer Anne Panning will give a reading from her new memoir, Dragonfly Notes on Distance and Loss, at 7:30 p.m. Tuesday, October, 16, in the Alumni Lounge at University of Lynchburg. Admission is free and the public is invited. Panning’s visit is part of the University’s Fall 2018 Thornton Reading series. The Thornton Writing Program, named for Richard H. Thornton, a graduate from the Class of 1907, has brought successful poets, novelists, dramatists, and nonfiction writers to the University of Lynchburg since 1975. Panning also is the author of The Price of Eggs, a book of short stories that was selected as a New York Times Book Review Editor’s Choice. In addition, she has had multiple works selected for the prestigious Best American Essays series.